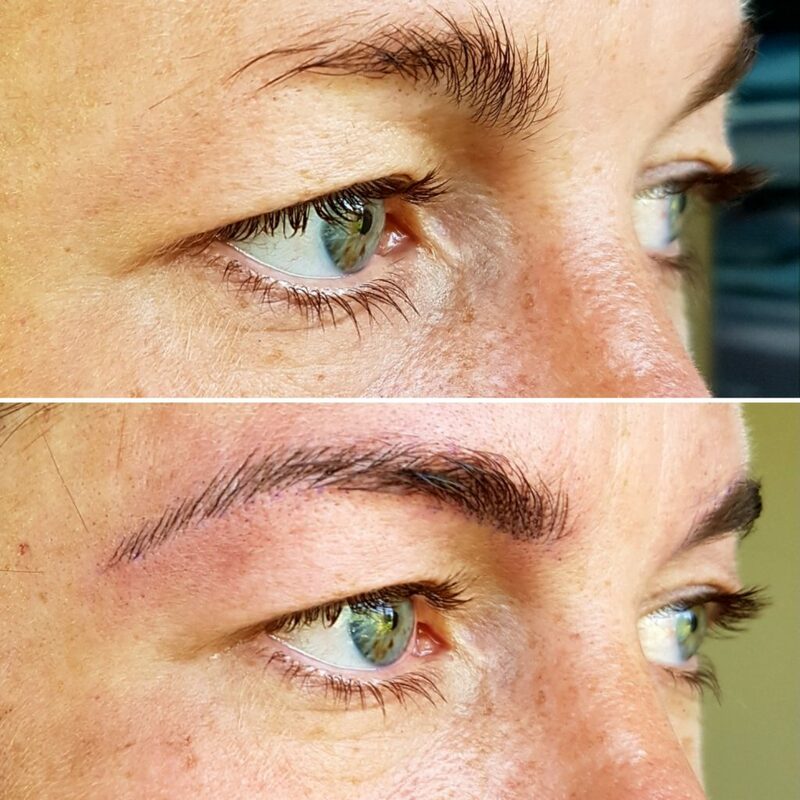 Embroidery Brows (Microblading) is a method ideal for anyone wanting to enhance the look of their eyebrows. The results are natural looking, hair-like strokes, regardless of the amount of hair present. The pigments used in this method have been formulated to match your original eyebrow colour, and if the eyebrows are still present they will blend perfectly into them. 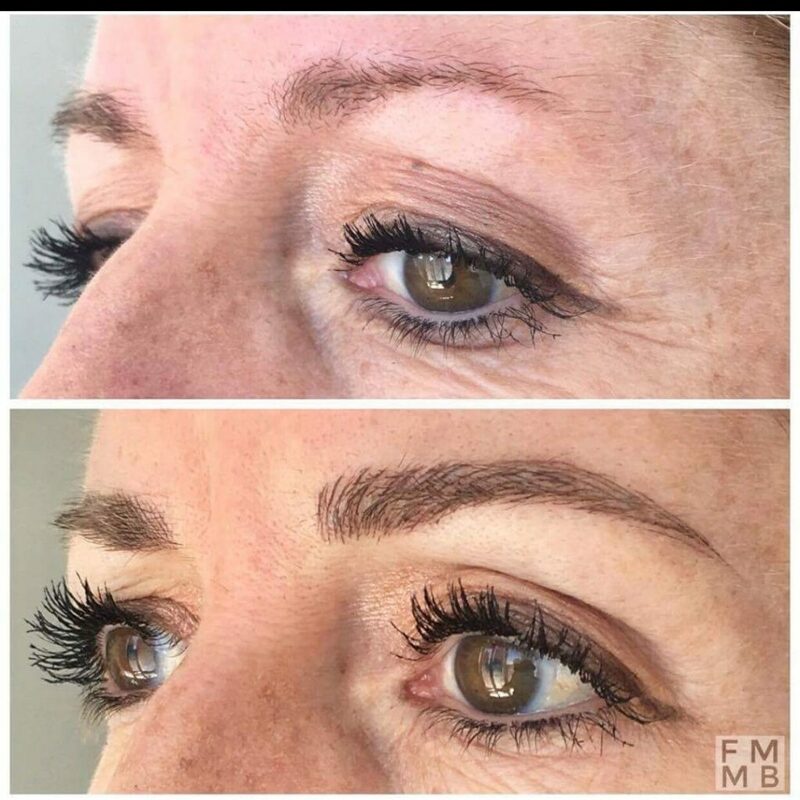 The results are natural and flawless, giving you a fuller looking brow. Initially, the brows will appear darker but will fade significantly over a two week period. A touch up required as it is difficult to predict how well the skin will retain the pigment. 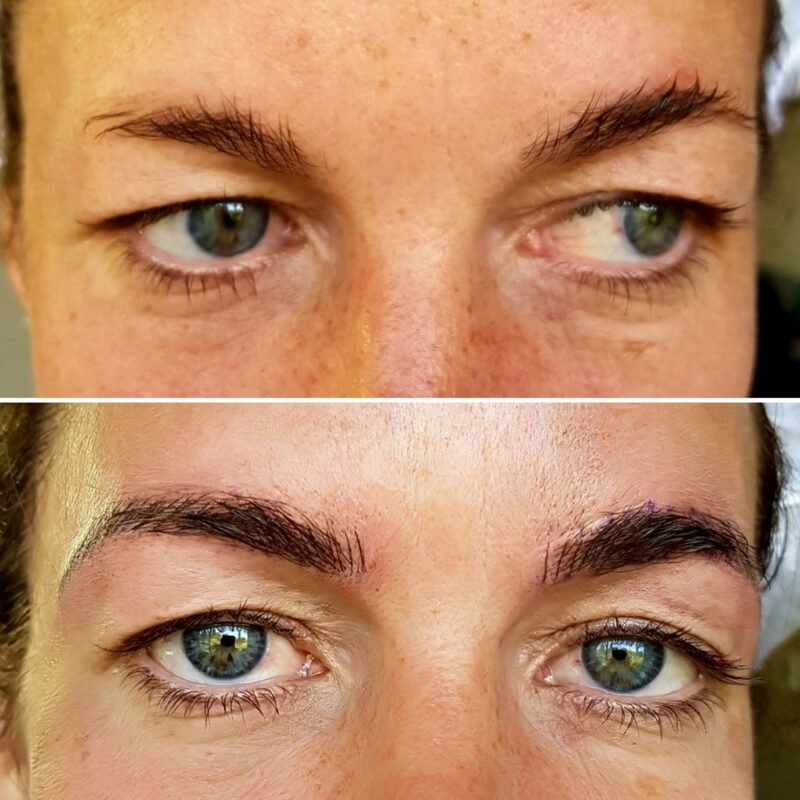 Eyebrow Embroidery is a 2 step process – usually 30 – 60 days apart. This is very important to complete 2 visits. The initial procedure takes approximately 1.5 – 2 hrs. A consultation is undertaken, a colour tone chosen and the initial outline of the procedure area is drawn on for the client to approve. The end result will depend on 50% pigment and 50% healing. We all heal differently, and what works on one client may not be effective on another. This is why a second visit is so important, as it corrects any irregularities in colour tones, and makes the look permanent. A second appointment is always required and is referred to a touch up, which takes approximately 1 hr. This usually happens after 30 – 60 days because it takes that long for the pigment to settle into the skin. It is IMPERATIVE you complete the touch up treatment, as without it, it will be a job half done and the results will not be optimum. This gives the client an opportunity to get used to the initial finish before a final touch up consolidates the pigment into the skin, thus preventing fading. Colour will have faded significantly in these 30 days as the skin heals, peels, and fades. The look of the brows in the first 10 days will be very defined and no indication of the final result. What if I need another touch up? Occasionally a 3rd visit is necessary for certain clients, again 30 days after the first touch up, this is not uncommon. Please note: Eyebrow shapes that do not suit a client face or facial structure, pigment colour that does not suit the tones of the client face colour will not be entertained irrespective to client’s pressure. The brow is semi permanent, so it will begin to noticeably fade after 12 months, even though it is only gradual fading. In order to keep the look fresh, a ‘touch up’ is advisable every 18 – 24 months. More frequent touch ups may be required where a client chose a soft lighter shade initially, or clients who did not follow after care advice. 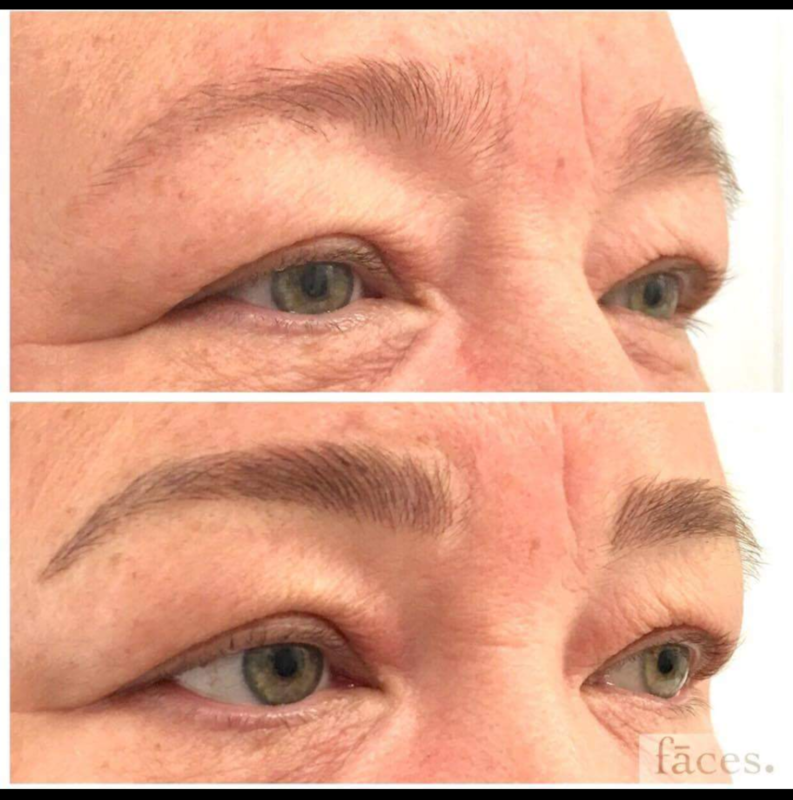 A noticeable difference will be readily apparent immediately following the microblading procedure. You will see your final results after the healing process is fully completed, usually in 2 – 3 weeks. Does the application hurt? Does it hurt afterwards? We take every precaution necessary to ensure the micro-pigmentation application is as pain free as possible. A wide range of medical grade topical anesthetics are used for your comfort. Some clients find the procedure a little uncomfortable, whereas other clients report no discomfort at all. A combination of 2 anesthetics are used, first a topical numbing cream (lidocaine/tetracaine) and then a local anesthetic (lidocaine/ephinephrine) is introduced once the microblading portion of the procedure had started. The area can be a little sore for the first few hours and tender to the touch for a couple of days. 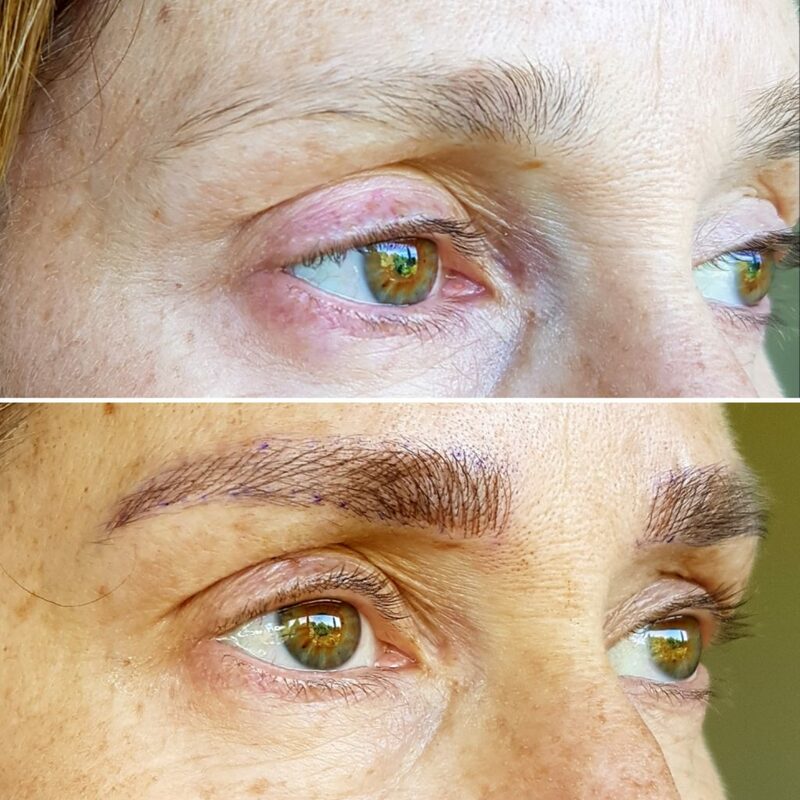 Many clients can walk right out the door, ready to show off their new brows. Initially stronger in colour, your new brow will soften to a natural looking and beautiful colour in 2 – 3 weeks. How do you choose a colour? What types of pigments do you use? We choose a colour together by applying small amounts of different pigments to the skin near to your brows and selecting the best match for your skin tone, features, and personal preference. Cosmetics and medical tattooing use the same pigments that we use. Our suppliers ingredients for our inorganic pigments are iron oxides, distilled water, alcohol, glycerine and general colours that are found in all retail makeup. Although the procedure is considered semi-permanent, these procedures do have flexibility in changing colour and shape to some extent. Colours will appear much darker immediately following the procedure but will soften and lighten during the healing process. The healing time is different for each individual and remember it takes time to adjust o a new look! During the procedure there may be some minor bleeding. This will depend on the client. If a person is taking blood thinners on a daily basis, then some slight bleeding may occur. There is usually some tenderness for a few days. The colour is much darker than you may expect for the first 6 – 10 days. How do I know if I am NOT ELIGIBLE for microblading? *Any treatment, medication, or illness that compromises the immune system/healing would make you NOT a good candidate for microblading or other micro-pigmentation procedures. PRIOR TO YOUR APPOINTMENT: 72 hours before and after your microblading appointment: avoid alcohol, aspirin/ibuprofen. ONE WEEK BEFORE: Stop taking the following supplements (vitamin E, B6, Omega 3, Ginko Biloba, St. John’s Wort) as they do contribute to thinning of the blood and may affect anesthetic efficacy. You may resume taking your vitamins 72 hours after the procedure. Your eyebrows may be swollen for the first few hours. The colour WILL look darker for the first 5 days (due to pigment oxidation) until the scab gradually lifts off, at this time it will lighten. For the first 3-6 days, the color intensity of your procedure will be significantly darker as well as larger and sharper than what is expected for the final outcome. Although the area will appear healed after 10 days, if will not be fully healed for 4-6 weeks to reveal actual colour, this is based on how quickly the outer layer of skin exfoliates. One procedure cannot guarantee desired outcome. In some cases, we need to see how our clients react to the pigment and review the healing process after the first procedure. Therefore, we offer one free touch up visit within 2 months of the first procedure. In very complicated cases (involving removal/color correction/camouflage/scar tissue/iron disorder) an extra charge may apply. We supply enough aftercare product to get you through the healing. 2-3 hours after your procedure, gently splash the area with cool water, then use the sterile sodium chloride gauze to gently remove any dried lymph. Use a sterile Q-Tip to apply aftercare product. We supply you with Aquaphor, however a client favourite is Cicaplast by LaRochePosay to accelerate tissue repair. Keep the area moisturized. Use a THIN layer of aftercare ointment daily and reapply as needed to relieve itching, dryness, tender for the next 2 weeks. This provides pain relief, moisture and promotes healing to help with color retention. Avoid soaps/facial cleansers on the area. Wash around them and pat dry with a towel. Facial cleansing cloths are much easier. Before Showering, apply a thick layer of barrier cream (Vaseline) and do not put your face directly into the water flow. If there is a lot of ointment build up and you want to wash them periodically, use a plain gentle cleanser and circular motion to remove residue, then pat dry gently with clean towel. Before Sleeping, apply a generous layer of aftercare ointment to prevent you from itching in your sleep, if you sleep on your face or side, use an airplane pillow around your neck to prevent your from flipping over. DO NOT RUB, SCRATCH OR PICK ANY CRUST ALONG THE BLADED AREA. It is normal for clumpy scabs to form and you need to let them come off naturally. Early removal of pigment crust will result in lost color. Avoid sweaty activity (hot yoga, spin class, running, heavy cardio) Salt water will fade tattoo. Our pigments are very high-quality iron oxide based which your body will slowly absorb. Each client is different, but the color will fade over time, generally lasts 1-3 years. We suggest annual color refresh treatment to keep your brows maintained and looking fresh. If you are planning a chemical peel, laser treatments or MRI, please advise your technician.